The participants express their appreciation to ICOMOS Brasil and to ITAIPU Binacional for organizing this forum, and based on the discussins held. 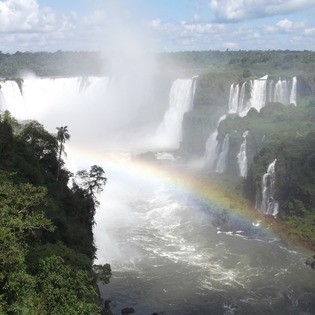 Preface:The Declaration of Foz do Iguacu (2008) was adopted by the ICOMOS Vice President for the Americas in the city of Foz do Iguaçu, Brazil, on May 29, 30 y 31, 2008. The Presidents and Members of the National Committees of Argentina, Brazil, Chile, México and Paraguay, met jointly with the ICOMOS Vice President for the Americas in the city of Foz do Iguaçu, Brazil, on May 29, 30 y 31, 2008, with the objective of reflecting on the concept of the “Spirit of Place”, the main theme of XVIth General Assembly of ICOMOS to be held in Québec in October of 2008. On the concept of “Spirit of Place”. The concept of Spirit of Place is linked to the interaction between the material and intagible components of natural settings and/or of those built by humans. This is an essential notion, since by its very definition, a “place” is not just any space, but a space characterized by a singular identity. In this sense, the “spirit” is the vital breath that expresses such identity, resulting from the relationship between a specific culture and the location in which it exists. Among the elements that constitute or have an impact on the “Spirit of Place,”. 2. The importance of understanding the “Spirit of Place”. The identification of the material and the intangible components that define the “Spirit of Place” is essential for the preservation of the identity of communities that have created spaces of cultural and historical significance, and that have transmitted them from one generation to the next. The study, analysis and understanding of the components of a place are appropriate resources in identifyin the actions needed for preservation, understood as actions that allow the expression of the spirit. 3. Threats to the “Spirit of Place”. ICOMOS, Foz do Iguacu, Parana, Brazil, 29-31 May. It specifies that the tangible and intangible components of heritage are essential in the preservation of the identity of communities that have created and transmitted spaces of cultural and historical significance. The concept of “Spirit of Place” should be integrated in the processes of urban and territorial planning as the means to comprehensively preserve natural and cultural landscapes, as well as cities and urban areas of historic and cultural significance. That urban legislation, plans and new development projects in natural and man-made settings take into consideration their possible impact on the “Spirit of Place”.